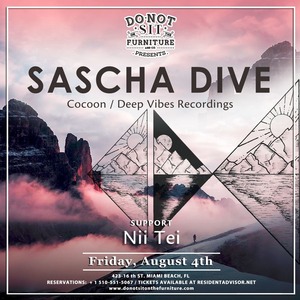 Friday, August 4th, Do Not Sit On The Furniture presentsSascha Dive[Cocoon / Deep Vibes]https://soundcloud.com/sascha-dive-going-deeperSupport:Nii Tei• Sascha Dive • Sascha Dive has made quite the impression on the international house and techno circus over the last years. Not only taking his sound and vision to the world's finest floors, he still manages to release more and more music. Dive has imprinted a vast amount of productions and remixes on top shelf labels such as Cocoon, ‘Tsuba’, ‘Freebase’ & ‘Deep Labs’ to name a few while running his own "Deep Vibes" label with great success. He’ll be bringing those deep vibes all the way from Frankfurt to unleash on us and we couldn’t be more excited.